All Star är en av de absolut bästa SUP och paddeltorrdräkten på marknaden tycker vi. Den är superlätt, strechig och den andas bättre än alla andra torrdräkter vi testat för sporter där man rör sig mycket och behöver ventilation. OBS halslåset på denna typ av dräkt är neopren för maximal komfort. Så inte till för att hålla helt tätt vid långvaritg dykning med huvud under vattnet. Tabellen är allmän för alla starboards kläder, för torrdräkten skall du gå efter Tops kolumnen och sen måtten på chest och waist. Starboard Apparel is proud to announce the release of the All Star SUP Suit, a brand that is part of the ongoing evolution of modern day water-sports as pioneers and innovators. Developed with the most advanced ultra flex technology on the market, this suit is set to change the way people paddle in cold water climates. Built from a special weather adapting technology and a carefully designed panel layout that increases motion and flexibility, paddling in cold conditions will never be the same. The suit has a number of revolutionary key features making paddling in cold weather even easier and more enjoyable than ever before. Eliminating the need for wetsuits and bulky clothing, the All Star SUP Suit is designed to make movement on the water as easy and natural as possible. Paired with thermal under garments you stay warm and dry without compromising performance. The waterproof fabric and shake to dry feature of the suit means that you will never have to climb into wet suits and clothing again, allowing the time between sessions to be shorter. The flexible and lightweight fabric makes taking off the suit that much easier, which is crucial in cold water climates where wind chill and cold air can make changing for a paddle unbearable. 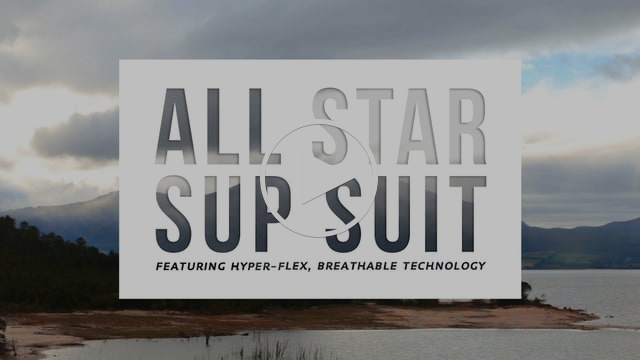 To see the campaign video on the revolutionary All Star SUP Suit click on the link https://vimeo.com/138620520 or click on the image below. Made from the most flexible 3 - layer laminated membrane allowing the suit to flex in all the right places. This combined with our strategic flex panels makes the All Star SUP Suit one of the most comfortable and user friendly suits on the market. A specifically designed torso panel layout radically increases flexibilityand reduces tension under the arms during paddle strokes allowing for a full vertical stretch along the back and horizontal stretch on the torso side panels. The All Star SUP Suit is designed with the cold climate paddler in mind. The suit is made from the breathable and waterproof Clima-Core material that changes and adapts based on the conditions one is paddling in. The regulation of this material helps keep the body at near perfect temperature for increased paddle performance. Starboards uniquely designed neck-closure system has been developed to keep you sealed and provide you with a more comfortable paddling experience. Along with a 100% Waterproof Zip, the zip garage is placed a few centimetres lower than normal to avoid abrasion on the neck whilst paddling. The neoprene neck panel is also strategically extended to provide a more efficient seal. The suit features Latex seals on the wrists and ankle cuffs, which makes it one of most comfortable Semi-Dry Suits on the market. The Latex seals are adjustable, allowing you to trim them to fit your personal requirements. The latex seals prevent water from rushing up into the Suit when falling in the water. The suit was designed to be as slim as possible to aid mobility. Our adjustable straps allow you to tailor the suit whilst wearing it. The straps can be loosened when wearing multiple layers of insulation and tightened when wearing less, insuring the perfect fit. This is an exclusive feature to Starboard. The reflective trims on arms and legsincrease safety and visibility during early morning and evening session out on the water. The Clima-Core material is an extremely durable material and will not succumb to rips or tears with ease. However, if you do puncture or tear your suit, Starboard has supplied an easy application repair kit with each suit that require no more than an iron and 5 minutes of your time. Positivt överaskad över hur denna dräkt andas. Trodde man skulle få en instängd och svettig känsla under träning men så är inte fallet. Känns lätt och smidig och man har full rörlighet utan att det stramar åt någonstans. Fördelen med en sån här dräkt är att man kan slappna av på brädan på ett helt annat sätt. Trygghetskänsla när man paddlar ensam kalla dagar. Jag är 179cm, 85kg och Large passar mig perfekt."